The high-ceilinged, white-washed space that is Bandar Sunway’s poke enclave opened in August last year. It’s a mostly make-your-own deal, with customers filling in a form that lets you pick a base – white, red or salad – with four sides, one poke, two sauces and unlimited toppings. In a hurry? Go for standard salmon, tuna or shrimp bowls. And if you’re extra hungry, you can up-size your bowl for RM6. It’s proven to be popular, with about 250 bowls sold on weekdays, and between 300 and 400 bowls ordered on Saturdays and Sundays. 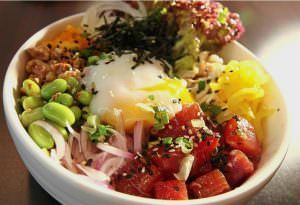 Unlike the sushi rice prevalent at most other poke bars, The Fish Bowl serves fragrant Thai long grain rice. “This makes the bowl substantial, but not over-filling,” said managing director Aaron Lim, 27. Our favourite though is the chewy red rice, which adds texture and a hint of that clean flavour and fragrance to a bowl. Top your bowl with the shoyu salmon or tuna (the closest to the original dish), lovely, fragrant kaffir lime salmon or sriracha salmon, or shoyu chilli tuna, which boasts some serious chilli padi power. The pokes are marinated for about six hours, so the kaffir lime salmon is slightly cured, somewhat like a firm ceviche. There’s also a garlicky cooked shrimp, and chicken baked with honey and herbs. Toppings include vegetables, nuts and fruit like pineapple and mango. For an extra RM2.50, you can add avocado, runny-centred poached egg or crisp-fried salmon skin. Right now, the available sauces are aioli, lime mayo and a Baby-Racha or Monster-Racha, depending on the firepower you want. 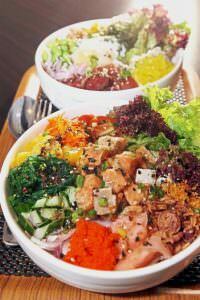 Debuting at the end of the month, along with a second outlet at One Utama, are some pre-set bowl choices, along with new bases, sauces and pokes, making The Fish Bowl one of the most varied in terms of choices. Look out for new bases like quinoa, pesto rice and jasmine green tea rice, while deep-fried softshell crab and unagi kabayaki will join the list of proteins. “There will also be new marinade flavours for the salmon and tuna. And we’re adding a hot, clear tea seafood soup which you can pour over the rice,” said Lim. Join our mailing list to receive goodies and updates from our TFB team.